It is inevitable that readers faced with a long poem are going to ask questions about its design. Some may wonder whether there is a scheme which controls all its individual sections, some may look for a major turning point, whilst others may look for common features which give an emotional, intellectual or imaginative unity. 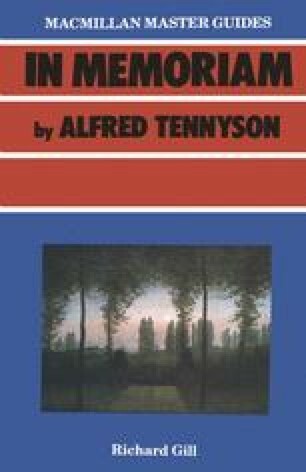 Tennyson, in conversation with a friend, once proposed a nine part division: 1–8, 9–20, 21–37, 38–49, 50–58, 59–71, 72–98, 99–103, 104–131. However, he never elaborated upon this, and, moreover, the division ignores the second Christmas poem (78). To many people this is a fatal objection; In Memoriam, as far as its time-scale is concerned, is plotted around three Christmases — 28–30, 78, 104–5 — and three springs — 38–39, 86 and 88, 115–116.